Researchers begin to map sensory over-responsivity in autistic children and adolescents. Using functional magnetic resonance imaging, a team of UCLA researchers have shown for the first time that children with autism spectrum disorder (ASD) who are overly sensitive to sensory stimuli have brains that react differently than those with the disorder who don’t respond so severely to noises, visual stimulation and physical contact. The team state that the findings could lead to the development of interventions that can help the more than 50 percent of individuals with ASD who have very strong negative responses to sensory stimuli, a condition called sensory over-responsivity (SOR). Interventions for this condition could significantly improve the lives of children with this form of ASD and their families. The opensource study is published in the journal JAMA Psychiatry. The researchers explain that this condition is distressing and impairing for individuals on the autism spectrum, as well as for their parents, who often feel confined to their homes because it’s too difficult to take their children out shopping, to the movies or to a restaurant. They go on to add that their research provides new insights into the brain differences that may cause sensory over-responsivity, which brings understanding how to treat it, from simple interventions like limiting exposure to multiple sensory stimuli to more complex interventions like cognitive-behavioural therapy. Previous studies show that ASD is a developmental disability that can cause significant social, communication and behavioural challenges. It occurs in all racial, ethnic and socioeconomic groups, but is almost five times more common among boys than among girls. The Centers for Disease Control estimates that about one in 68 children have been identified with autism spectrum disorder. The teams note that research on SOR, and particularly brain imaging research, is still very new and sensory symptoms were only recently added to the diagnostic criteria for ASD, two developments which may ultimately lead to clues as to why these children have such strong reactions to sensory stimuli. The current study showed large differences in brain response between children with ASD who have SOR and those who do not. Children with ASD who do not have SOR have brain responses to sensory stimuli much more similar to their typically developing counterparts without ASD, with results suggesting that there may be a compensatory mechanism in the brain helping them regulate their responses. For the current study, the team imaged brain responses to auditory and tactile stimuli in children and adolescents with and without ASD aged nine to 17. During imaging, the study participants were exposed to three kinds of sensory stimuli, hearing loud environment noises such as traffic, being rubbed on the inner arm with a scratchy wood fabric, and experiencing both the auditory and tactile stimuli simultaneously. Data findings showed that study participants with ASD and SOR had stronger brain responses to the sensory stimuli in brain areas that process sensory information, the primary somatosensory and auditory cortices, as well as in the amygdala, one of the brain’s emotional centers. The brain responses were even more severe when participants with ASD and SOR were exposed simultaneously to the auditory and tactile stimuli. They also found that all study participants showed a similar initial brain response to the stimuli, but youth with ASD and SOR were much slower in getting used to the stimuli, and reducing their brain response, than were children with ASD but not SOR. 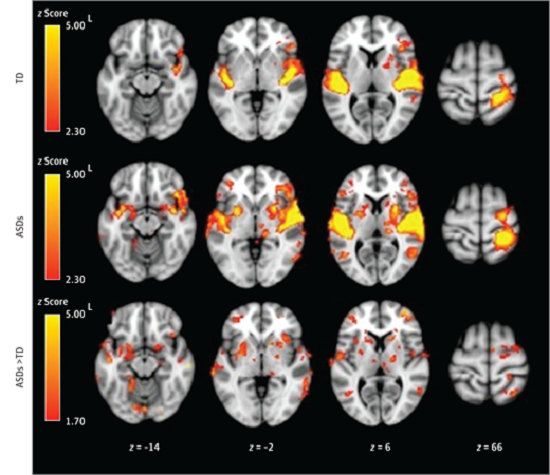 The researchers hypothesize that youth with ASD who do not have SOR may be compensating through strong brain connectivity between their prefrontal cortex and amygdala, an area involved in attention, response to threat and emotional reactions. They go on to add that the prefrontal cortex, is helping to regulate the strong response of the amygdala. The group stress that there aren’t many good treatments for SOR, however, their results suggest that an effective treatment might focus on creating coping skills to deal with stimulating environments rather than focusing on changing sensory processing. The team also feel parents and others working with kids with autism need to be aware of their sensory environments. For example, they say, a child might have more trouble being touched in a loud, crowded room. Or if a child has tactile sensitivity, parents may want to be particularly careful that they are wearing comfortable clothing before trying out a new environment, such as a movie theater or restaurant. Going forward, the team are continuing to study how children with ASD and SOR process sensory stimulation. They hope to better characterize and map the neurobiology of the brain’s reaction. Within-group contrasts are thresholded at z > 2.30 (corrected at P 1.70 (corrected). Between-group maps are masked by regions active in either within-group condition at z > 1.70 (uncorrected). ASDs indicates autism spectrum disorders; L, left; and TD, typically developing. Neurobiology of Sensory Overresponsivity in Youth With Autism Spectrum Disorders. Dapretto et al 2015.